Can anyone explain how to use the V-1 Buzz Bomb? Any help is greatly appreciated !!! Bringing the V1 to work is relatively easy, you just have to remember a few things about it. First step is to select one of the available V1 types and place them on the map (obviously). You should adjust it so that it points into the direction you want it to fire later on. and mark your target (the other button deletes the target again). The target doesn't have to be a specific object, you can place the target marker anywhere on the map. You should keep in mind though that the aim of the V1 is very bad, therefore the doodlebug might come down a few hundred metres away easily (if not more). 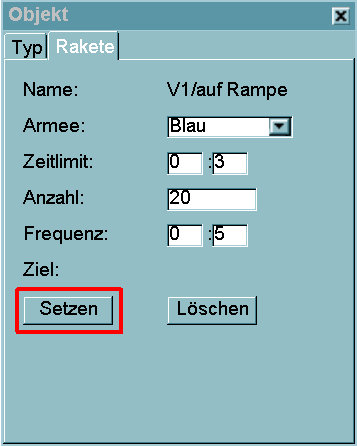 The biggest pitfall when using the V1 is that one has to remember to set the delay (named "Zeitlimit" in the above image) to at least three minutes. Unfortunately I forgot the reason behind this, but the V1 will not fire if there is a delay of less than three minutes. Therefore, always set the delay to \( \small\geq \) 3 minutes! The text field labelled "Anzahl" sets the number of V1 fired from this station. This one should be set to one at least. 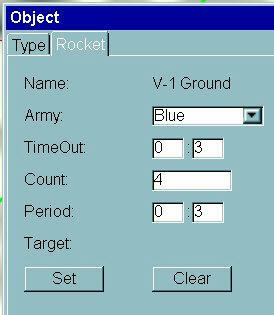 The field labelled "Frequenz" sets the time between two V1 launches. This one should be again set to at least 3 minutes. Thanks all for your help !! !